Do we call it the Lachie Neale Effect? If so, how do we account for the Suns? However you attribute it, Queensland footy has enjoyed its most promising start to an AFL season in many years. Five wins in six games leaves the combined Lions/Suns state representation top of the state ladder, at least percentage-wise. 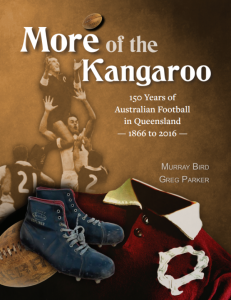 So it would seem an opportune time for a book that traces the long history of Australian Rules in Queensland. Providently, Murray Bird and Greg Parker prepared one earlier. And they’ll be launching the book in Melbourne tomorrow night. Details here.